See who is most effectively driving out modern slavery and exploitation from their supply chains through a live transparency map that collates real-time information for the UK's Cities, Councils, Districts and Boroughs. A year ago the CEO of the Transparency in Supply Chains Register* TISCreport.org, Jaya Chakrabarti MBE presented the state of compliance with section 54 of the UK Modern Slavery Act in Westminster to Parliamentarians and key industry leaders (only half jokingly subtitled “50 Shades of Compliance”). It was fair to say that, bar a handful of exemplars, the level and quality of compliance was as variable as it was poor. A lot has changed in twelve months however. There is now a review of the Modern Slavery Act with a focus on the Section 54 transparency clause. Most recently at the UN General Assembly (UNGA), Prime Minister May has called for action from the international community, endorsed by 77 states. Whilst the UK, US, Canada, New Zealand and Australia have committed to eradicating modern slavery from global supply chains. This, which has followed the UN Sustainable Goal 8.7  shows a powerful global movement dedicated to ending the trade of human lives for profit. But how are these initiatives manifesting in real actions on the ground? 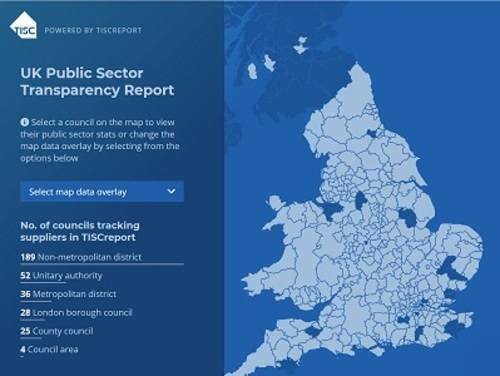 To answer that question TISCreport has published a live Transparency Map to showcase the potential power that has until recently lain dormant within the UK’s local government procurement budgets. Members of the public can now see how their cities, counties, districts and boroughs are using the buying leverage afforded by public funds to drive modern slavery and labour exploitation out of their supply chains. The TISCreport platform enables ethical buyers across all sectors to quickly check their supply chains for available corporate transparency data. By uploading their suppliers from their systems, public sector buyers can maintain the transparency of their supply chains, and they can check modern slavery act compliance all at zero cost to the taxpayer. Anyone can see how their city is faring on public sector supply chain transparency by clicking on their city on https://tiscreport.org/public-sector/uk-transparency-report/. Rather than being a static snapshot, many other live transparency data sets will be added to this map, making it the best available picture of transparency of cities in the UK, using unique data sets that are not held anywhere else. At this point in time the most transparency data is available for Wales and England, with the beginnings of visibility in Scotland. The Welsh Government’s success has its foundations in their Ethical Employment in Supply Chains Code of Practice, which is also administered online on TISCreport. In England, engagement has been accelerated through regional campaigns and more recently, the Coop Party Anti-Slavery Charter. Some may wonder why there is a focus on cities. Jaya explains, "The UK Modern Slavery Act has paved the way for doing some very exciting things globally. But cities are able to react and make decisions more quickly than Governments. Following Bristol City’s call to action and Welsh Government’s pledge to end labour exploitation in its supply chains through its Ethical Employment Code of Practice, hundreds of UK city administrations have joined them. The City Transparency Map we’ve produced benchmarks what UK cities are doing with their public buying leverage, just in time for the Global Parliament of Mayors Summit that is being held in Bristol this month. Add in Anti-Slavery Week and the timing is perfect for a storm of transparency activity. We’re all very excited, and we’re only just getting started!" "The power of City Leadership is evidenced in this single map. Back in 2015, Bristol was the first city to commit to Supply Chain Transparency on TISCreport, after a small social enterprise with a global vision asked an important question. Whilst this is the very first iteration of the map, the potential is already starting to emerge. As Welsh local authorities have shown, the more suppliers that are transparently shared, the more that can be determined from the data about those suppliers and other buyers. This in turn will help make better buying decisions. Local authorities have raised the bar for their suppliers, showing how transparency can lead to effective actions to protect vulnerable workers beyond a tendering process. Many are starting to invite their suppliers to share their own tier 1s which increases the power of transparency exponentially. However this becomes even more powerful if the data is about live supplier relationships rather than historical. Standard procurement guidelines enable buyers to ask for information to be uploaded. But buyers no longer need to settle for receiving a boilerplate compliance document when compliance can be checked live. Once this message is received, the quality of compliance will increase. Collaboration combined with automation (machine learning, AI) will make this much easier. The technology already exists for this to happen. Earlier this year Elizabeth Denham, UK Information Commissioner, spoke of Trust, Transparency and just-in-time Freedom of Information (FOI) . TISCreport believes that Just-in-Time Transparency will interlock to provide the best outcomes for vulnerable workers. In accordance with section 54 of the UK Modern Slavery Act TISCreport tracks websites of all those companies and groups known by the system to be over £36M in turnover as well as recording voluntary compliance from organisations below the threshold. More critically, the system automatically alerts companies that are overdue that they need to take action as long as social media or email contact details are available. As a B-Corp social enterprise, TISCreport funds itself through subscription fees from organisations able to afford the £200 annual subscription fee and and transparency data services. 50% of the subscription fee goes directly to anti-slavery charity Unseen, which runs the UK Anti-Slavery Helpline. This press release was distributed by ResponseSource Press Release Wire on behalf of Tiscreport in the following categories: Business & Finance, Media & Marketing, Public Sector, Third Sector & Legal, for more information visit https://pressreleasewire.responsesource.com/about.